By now you know how important a healthy lifestyle is for your well-being and longevity. And while a healthy diet is a major contributing factor, exercise is just as important and often overlooked. According to a CDC report in 2018, only 23% of U.S. adults get the proper amount of exercise. Adults 18-64 should be exercising for 2.5 hours each week. That includes aerobic physical activity and muscle-strengthening activities. Older adults who can no longer commit to 2.5 hours per week should be as physically active as they can be. While health conditions can get in the way of a vigorous routine, seniors can still participate in low-impact exercises that will have impactful benefits over time. Falls are the leading cause of head injuries and broken hips in adults 65 and older. However, falls may be preventable! Balance-centric and flexibility focused exercises such as yoga and tai chi improve muscle strength and bone density. Additionally, range of motion and flexibility degenerate over time. If a joint can’t operate as needed, the body will put pressure on another part to pick up the slack, which could lead to additional strain or injury. Both cardio and strength training exercises increase blood flow to the heart and lowers blood pressure. Seniors will find their endurance and energy levels increase, making it easier to perform daily chores, hobbies, and activities. Exercise also improves respiratory function, leading to strong lungs and airways. Even gentle exercise has a major impact on the development of disease. Regular exercise sends oxygen to muscles and organs and removes waste. Both vascular dementia and Alzheimer’s disease are attributed to a buildup of plaque in the brain. 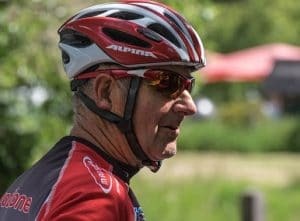 Studies have found that older adults who don’t exercise are more likely to develop dementia than those who do exercise. Other chronic conditions can be regulated or managed with exercise. A stroke can be prevented through diet and exercise. Those with Parkinson’s can maintain balance and coordination, extending their independence. Exercise has also been shown to lower blood sugar in those with type 2 diabetes. Fifty-four million Americans have osteoporosis, a disease of the bone where those afflicted lose too much bone mass and make too little bone tissue. While losing bone density is a normal part of aging, those with osteoporosis have an increased risk of fracture due to the disease—one in two women and one in five men will break a bone as a result. Regular exercise such as walking, or jogging can help increase bone strength. Arthritis is one of the most common causes of disability among U.S. adults. Not only will exercise help you lose weight, which will take stress off your joints, but it will strengthen the muscles that support those joints. Group exercise such as walking clubs, water aerobics, yoga, etc. offer a great opportunity to socialize. Isolated seniors can experience loneliness and depression, which can lead to other health issues. Exercise also releases endorphins triggering a feeling of euphoria, which has been known to help reduce stress, ward off anxiety and depression, boost self-esteem and improve sleep. Aegis Living’s Life Enrichment program offers many daily exercise options for seniors of all abilities to improve strength, coordination, and balance for healthy aging. To learn more about how our programs improve the body, mind, and spirit, contact a Life Enrichment Director at your nearest Aegis Living community.